The Goldman Sachs Global Multi-Manager Alternatives Portfolio (GMMAP) received The Hedge Fund Journal’s UCITS Hedge award for “Best Performing Fund in 2016 (Multi-Manager – Liquid Alternatives category)” over a one year period ending in December 2016, based on its risk-adjusted returns. 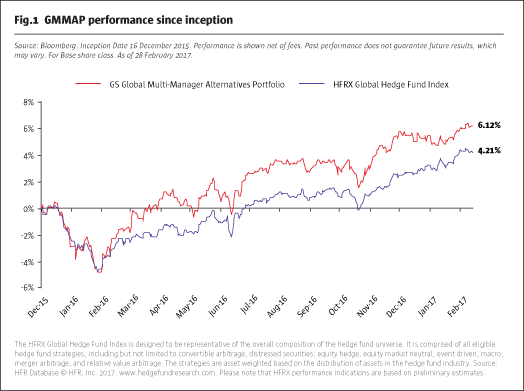 In absolute terms, GMMAP has also performed well, outpacing the HFRX Global Hedge Fund Index, as shown in Fig.1. “We designed the product to offer investors access to a diversified, multi-strategy portfolio of high quality hedge funds and other investment managers, with daily liquidity and appropriate fees,” says GSAM Managing Director, Robert Mullane, who sits in Goldman Sachs’ London offices on Fleet Street. GMMAP assets have already doubled to $600 million since this particular product was launched in December 2015. Additionally, the start of the GMMAP strategy, managed by the Alternative Investments & Manager Selection (AIMS) Group, conceptually dates back to 2013, “when we launched the same strategy for GSAM’s US clients,” Mullane recalls. The US strategy, which is run from New York by Kent Clark, Betsy Gorton and Ryan Roderick, currently contains eight of the nine managers in the UCITS. The GMMAP strategy was more of a product evolution than a fresh launch. It might seem bold for GSAM, which has been structuring UCITS for over 20 years, to have jettisoned its award-winning former fund of alternative UCITS funds. The firm felt that a fairly radical restructuring of the fund of funds business model was timely. “We wanted to evolve to a more innovative solution, and it has been well received by third party distributors, private banks and even pension funds,” explains Mullane. In terms of total expense ratios (TERs) or ongoing charge ratios (OCRs), Mullane claims that “GMMAP could cost the same or less than investing directly into [other strategies run by] these managers or a portfolio of managers that are following similar strategies.” GMMAP is even more likely to offer fee savings in situations where underlying managers’ performance has opposite signs, because GSAM itself is taking the performance fee netting risk. If profits made by one or more of the managers outweigh losses from the others – but by just enough to cover fixed management fees and expenses – then a traditional fund of funds structure would deliver negative performance, due to the performance fees paid to the profitable managers. In GMMAP however, investors would not pay any performance fee, but GSAM would need to use part of its management fees to reward the profitable managers. GSAM itself uses the product’s fees to remunerate the managers, and receives (any) residual remaining. There are scenarios under which GSAM would not receive any fees and for Mullane this demonstrates alignment of interests with investors: “Our model answers the challenges of the fund of funds fees, and this is particularly important in a low interest rate environment,” he argues. GMMAP finds it much easier to customise fees partly because it is composed of “dedicated” managed accounts rather than funds. The alternative UCITS universe is diverse, containing more than 1,000 funds, if absolute return products are included. However, GSAM’s AIMS Group uses more flexible structures to draw on a different, and potentially larger, pool of talent. One inspiration for GMMAP was that “the quality and availability of alternative UCITS is rather mixed. Some are constrained versions of flagship products, with lower volatility for instance, but charging the same fees. And access to managers is not always as good in UCITS,” as Mullane observes. Given this perceived backdrop, GSAM swept away legacy holdings and resolved to start with a clean slate: sourcing managers, devising tailored strategies, and negotiating sub-advisor fees, all from first principles. This means GMMAP can avail of a subset of managers who are comfortable with a sub-advisory relationship, but who might be deterred from managing a traditional UCITS – for multiple reasons, which include “reputational risk; a public track record; the risk of cannibalisingexisting products; travel and paper chasing; and regulatory reporting,” Mullane enumerates. GMMAP managers retain the freedom to choose their own counterparties, and negotiate associated agreements such as ISDAs. GMMAP aspires to the best of both worlds – the existing UCITS universe is potentially at its disposal (to the extent that managers are prepared to sub-advise a managed account, and one that might not be run pari passu with their existing funds) as are a number (being discovered over time) of other managers not running UCITS funds. So Mullane is pragmatic on the topic of exclusivity. “Some GMMAP managers are, at present, exclusively running UCITS strategies for GMMAP. While we appreciate exclusivity and preferential terms, we do not want to rule out high quality managers that already have, or plan to launch, a UCITS fund,” he explains. GSAM has for many years been running liquid alternatives mandates for certain clients, and GMMAP can also involve a high degree of customisation for some strategies. GSAM’s 20 years of experience in structuring UCITS funds is brought to bear within GMMAP. For instance, GSAM worked collaboratively with a global macro manager to craft a dedicated UCITS managed account. “The flagship strategy uses derivatives and is capacity-constrained, so we knew that a different version to the main fund would be needed. The manager mapped their derivatives positions using liquid futures contracts, and captured a large proportion of the alpha, with lower turnover and lower cost. The strategy fits very well in a portfolio context,” Mullane details. GMMAP looks at the UCITS rules from a bottom up perspective and does not make use of total return swaps with indices of non-UCITS strategies. Nor does GMMAP invest in commodities. Transparency is a key benefit of the sub-advised accounts, but hundreds or thousands of line items across multiple portfolios can be unwieldy to analyse – and need to be made sense of. Here, GMMAP’s administrator helps out with risk aggregation, producing a daily risk report that runs to over 100 pages. “This is a very powerful report which includes scenario analysis. It is reviewed by our risk team, who alert the portfolio managers to any significant findings,” stresses Mullane. GMMAP scours the globe for talent, and benefits from belonging to GSAM’s AIMS Group, which contains 100 investment professionals who allocate a total of $150 billion to external managers, under the leadership of Chris Kojima, as head of AIMS, and Kent Clark, who is Chairman of the AIMS Hedge Funds and Public Markets Investment Committee and is co-pm of the fund. “We sit in a very privileged position, with access to information and resources including GSAM’s economic analysis, ideas and market research. Our open door policy gets us a high level of introductions,” Mullane finds. The staff are spread across several pillars, including real estate, private equity, ethical investing, public equity, fixed income and credit, and hedge funds. Thinking laterally, GSAM does not always find managers in the most obvious places. “There are lots of great hedge fund managers but also many others in absolute return. One of our equity long/short strategies is run by a more dynamic equity manager, and one of our credit managers is attached to a private equity firm. This illustrates why we do not want to build barriers to accessing the right talent,” Mullane emphasises. “We are all motivated by the same drivers of picking high quality managers and performing robust portfolio construction,” he underscores. AIMS has a thorough, and multi-stage, due diligence process with multiple sign-offs needed. Investment due diligence, operational due diligence (ODD) and portfolioconstruction teams effectively have vetoes at each stage. Even within ODD, several specialists, such as GSAM controllers, legal, tax and compliance (some of whom may be drawn from other parts of GSAM), can also exercise a veto. But GSAM argue that their due diligence process is partly distinguished by “non-traditional factors” such as soft and qualitative considerations. “Typical due diligence is backward-looking in focusing on track records, and freezing a manager at a point in time. We want to focus on successful outcomes in future, because the environment and the fragility of teams mean that the future is unlikely to be the same as the past,” Mullane explains. When interviewing managers, he wants to take a dispassionate look at the facts. One metric that GSAM looks at is the number of direct reports a fund manager has, as too many can turn into a distraction, Mullane believes. Intelligence, discipline, drive, self-awareness and culture are other qualitative considerations. Across the whole of AIMS, over 900 managers were evaluated in a year, with approximately 9% of them approved for potential investments. A potential concern about some of the most intensive and extensive due diligence processes, is that they might raise bars that smaller, younger and more entrepreneurial investment managers cannot surmount, and restrict allocations to the largest managers. This is not necessarily the case at GSAM however. “We are completely agnostic about levels of assets,” Mullane confirms, and he is of the opinion that long/short equity strategies are easier to run with lower levels of assets, due to their (relative) simplicity. GMMAP does have allocations to managers who run hundreds of billions and have been in business for decades. At the same time, GMMAP is invested with managers who run hundreds of millions and set up shop only a few years ago. Indeed, start-ups are very much on the wider radar screen because the group is among those that are still actively involved in seeding new and emerging hedge fund (and other) managers. These deals keep in mind the possibility of subsequent liquid alternatives launches. “When we seed, we will usually try to seek a right of first refusal over any UCITS launch,” Mullane reveals. Currently, many of GMMAP’s managers are headquartered in the US, which is home to more hedge fund managers and assets than other regions. But GSAM is a global organisation so managers in Europe, Asia, and elsewhere, are being actively monitored. GMMAP’s gross exposure (to all asset classes) has ranged significantly while its net exposure has varied even more widely since inception in December 2015. These fluctuations are partly a function of the product having been in ramp-up phase for its first year or so. However, the product’s freedom to rebalance allocations (combined with managers’ varying exposures) could result in greater fluctuations in gross and net exposure, in future. “Daily liquidity and transparency are additional tools for managing the product. We are not necessarily doing daily shifts or making macro calls intra-day but are rather allocating within the same manager selection disciplines,” Mullane outlines. 2016 gave rise to several opportunities that allowed the team to demonstrate prowess at tactical rebalancing. The Brexit vote was a prime example of how they think. “The polls were very close and we saw limited market response to a Remain vote, but an outsized negative scenario associated with a Leave vote. Therefore on a probability-adjusted basis, this looked like a negative event,” Mullane explains. GMMAP consequently brought down its beta exposure, by scaling back long-biased long/short equity allocations, while accelerating the on-boarding of a global macro manager, in sufficient time for strongfourth quarter performance from macro. Earlier in 2016, GMMAP had, during the first quarter, seized on market turbulence to augment the allocation to an event driven manager who performed well over the rest of the year. But, illustrating the importance of a diverse strategy mix, in early 2016, GMMAP’s trend-following strategy performed strongly. GMMAP aims to add value through both top-down strategy allocations and bottom-up manager selection. “Both the event driven manager and the global macro manager beat their respective strategy indices,” according to Mullane. Recent sector allocations appear in Fig.2. AIMS’ roots lie in Goldman Sachs’ 1969 acquisition of Commodities Corporation – a powerhouse of talent that has spawned many legendary hedge fund managers for the next two generations. GSAM began allocating to hedge fund strategies in the 1990s initially as a fund of funds, and the AIMS umbrella was created in 2008. Later, advisory solutions were developed. Liquid alternatives are now seen as a key locomotive of growth. “We are very much on the front foot with liquid alternatives. They are currently around 10% of our hedge fund assets but we expect this to grow,” Mullane enthuses. 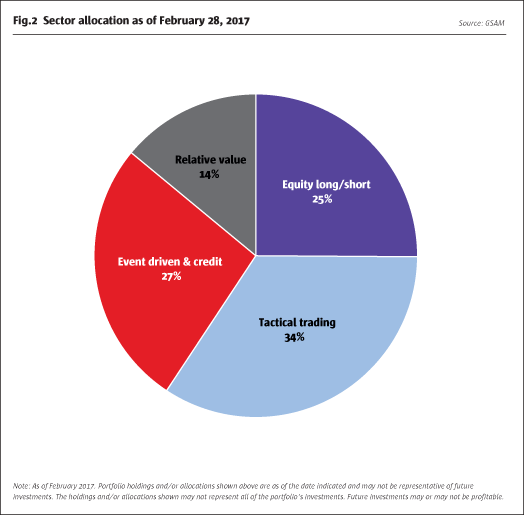 AIMS data suggests that alternatives have, historically, outperformed equities and bonds 45% of the time, in absolute terms. For many allocators the risk profile is the greater attraction – and liquid alternatives have shown lower beta, lower correlations, and lower drawdowns. AIMS currently has allocations to 19 managers in liquid alternatives. This includes a growing number of single manager UCITS funds that GMMAP could not allocate to, as it does not invest in funds. GMMAP is marketed in most of the major European markets, subject to its marketing passport, and can be invested in by retail investors or institutional investors. Minimums are US$5,000 for retail and US$ 1 million for institutional investors, meaning that the “mass affluent” market, including personal pension savings, is very relevant, as well as traditional high net worth individuals and institutions. Plans are underway to obtain approvals for distribution into certain Asian markets. 1. GSAM leverages the resources of Goldman, Sachs & Co. subject to legal, internal and regulatory restrictions. 2. Stocks are represented by S&P 500 Price Index; Bonds are represented by the Barclays US Aggregate Bond Index; Alternatives are represented by the HFRI Fund of Funds Index over a 3 year period (277 periods of 36 month rolling returns).